Avira AntiVir Personal is free antivirus solution that offers basic virus protection. The software is available from www.free-av.com instead of the Avira company website (which is www.avira.com). The recently released version 9 requires 40MB of free hard drive space and uses less than 42MB of system memory in idle mode. In addition to virus protection, it also offers real time file access monitoring (AntiVir Guard), hidden malware protection (AntiVir Rootkit Detection) and Windows Explorer files and folders monitoring (Shell Extension). KeePass Password Safe is an open source password manager. 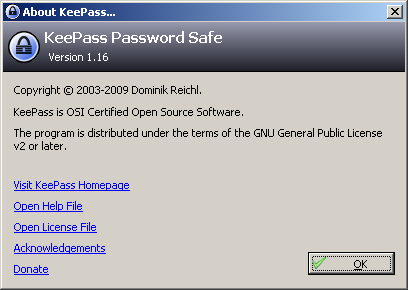 There are two version of KeePass: Classic and Professional. This review focuses on Classic Edition (version 1.16). One major difference between Professional and Classic is the requirement of Microsoft .Net Framework 2.0 or greater. The full product comparison is available here. Both versions utilize the best and most secure encryption algorithms (i.e. AES and Twofish). It works with Microsoft Windows 98 and above. Additionally, the Professional Edition works with Linux, Mac OS X and BSD (which requires Mono 2.2 or greater). Jarte is a free word processor based on Microsoft WordPad. It has features that WordPad lack but not as heavy as Microsoft Word. The install file is fairly light at 2.8 MB. There are 8 dictionaries included with the installation. Jarte does not perform background spell checking. This feature is available on the Jarte Plus ($19). Jarte is also USB flash drive friendly as it can be run from it. The required disk space is 9 MB with all languages dictionary installed.